The fine grading stage of construction for roads, parking lots and driveways is critical to the success of the finished pavement product. This technique is used on residential and commercial properties in Danbury. The construction process ends at this step there are more steps to building an asphalt surface. 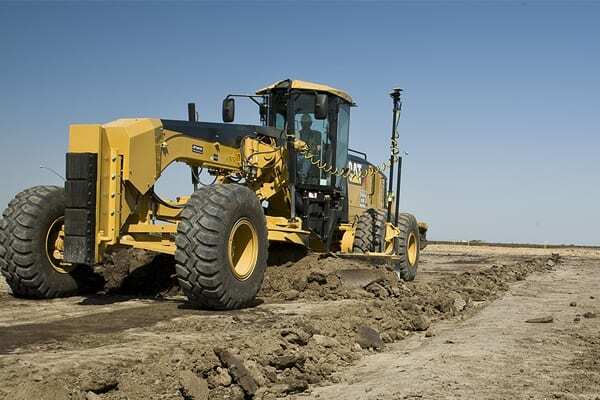 Greenway utilizes small and large motor graders combined with compaction and survey equipment to ensure that specified grades are met as well as smoothness and compaction. Using survey equipment to establish grades enables Greenway to successful direct water run off to the proper drainage location and maximize grade accuracy. The team at Greenway Industries works with accuracy and efficiency to leave the best possible surfaces to be paved on in Danbury. In order to protect your asphalt driveway, regular sealing is recommended. The paving job is only as good as its base. Grading is something that is commonly overlooked. Proper grading is the key to having a good paving job. We can install rock and grade for concrete, asphalt, or simply fine-tune your driveway or road. Fine grading is the customization of a site once mass grading is completed, it’s also the last step before pavement and curbs are installed, and requires a high degree of accuracy. Let us grade your next area of work. Our highly trained professional crew is equipped to take on small to medium scale projects that require accuracy, quality and precision. From stripping topsoil, to final grading topsoil we provide a wide variety of grading services. 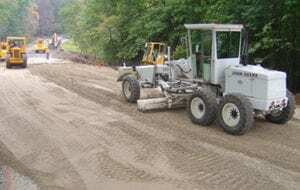 Reach out to us for high quality driveway, road and parking lot grading, removal of concrete, asphalt or excess fill. We have crews that are capable of fine grading streets, parking lots, curb and gutter, and sidewalks. The grading process begins with rough grading. A surveyor generally maps out the dimensions of the finished product. Stakes will be placed in the ground, with markers to indicate the depth of the final grade. shaping and preparing the land for concrete. leveling and compressing the fine aggregate, so it’s prepared to their specifications. Throughout the grading process, automation is used to determine that the specified grades for the job are being met. Proper drainage so that water doesn’t pool. Greenway Industries prides ourselves on completing a precise job. Our highly experienced crew is equipped to handle residential and commercial driveways and parking lots. We have years of experience in fine grading and surface preparation to assure proper drainage, extending the life of the work and assuring customer success. WHY FINE GRADE YOUR DRIVEWAY OR LOT? Fine grading is the first step before laying asphalt down. We want to make sure that the sub-grade is stable so the driveway is built on a solid foundation. A driveway is only as good as the subgrade beneath it. If you wish to use asphalt, fine grading is necessary to ensure proper drainage as well as provide your driveway with stability. If you live in Danbury, Ridgefield, Brookfield or the surrounding area, call us today for a free estimate from one of our experts. Get started on your fine grading project today!